The use of an initial letter "X" for these purposes is facilitated by the ISO 3166 rule that no official country code beginning with X will ever be assigned. Because of this rule ISO 4217 can use X codes without risk of clashing with a future country code. ISO 3166 country codes beginning with "X" are used for private custom use (reserved), never for official codes. For instance, the ISO 3166-based NATO country codes ( STANAG 1059, 9th edition) use "X" codes for imaginary exercise countries ranging from XXB for "Brownland" to XXR for "Redland", as well as for major commands such as XXE for SHAPE or XXS for SACLANT. Consequently, ISO 4217 can use "X" codes for non-country-specific currencies without risk of clashing with future country codes. The ISO 4217 standard includes a crude mechanism for expressing the relationship between a major currency unit and its corresponding minor currency unit. This mechanism is called the currency "exponent" and assumes a base of 10. For example, USD (the United States dollar) is equal to 100 of its minor currency unit the " cent". So the USD has exponent 2 (10 to the power 2 is 100, which is the number of cents in a dollar). The code JPY ( Japanese yen) is given the exponent 0, because its minor unit, the sen, although nominally valued at 1/100 of a yen, is of such negligible value that it is no longer used. Usually, as with the USD, the minor currency unit has a value that is 1/100 of the major unit, but in some cases (including most varieties of the dinar) 1/1000 is used, and sometimes ratios apply which are not integer powers of 10. Mauritania does not use a decimal division of units, setting 1 ouguiya (UM) equal to 5 khoums, and Madagascar has 1 ariary = 5 iraimbilanja. 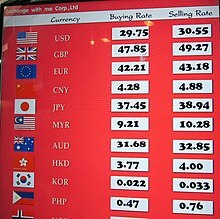 Some currencies do not have any minor currency unit at all and these are given an exponent of 0, as with currencies whose minor units are unused due to negligible value. There is also a three-digit code number assigned to each currency, in the same manner as there is also a three-digit code number assigned to each country as part of ISO 3166. This numeric code is usually the same as the ISO 3166-1 numeric code. For example, USD ( United States dollar) has code 840 which is also the numeric code for the US (United States). In 1973, the ISO Technical Committee 68 decided to develop codes for the representation of currencies and funds for use in any application of trade, commerce or banking. At the 17th session (February 1978), the related UN/ ECE Group of Experts agreed that the three-letter alphabetic codes for International Standard ISO 4217, "Codes for the representation of currencies and funds", would be suitable for use in international trade. XBT  (formerly BTC)  _ 8 Bitcoin BTC conflicts with ISO 4217 because BT stands for Bhutan.